I feel like there is a huge misunderstanding of metabolism. This becomes apparent with comments expressing concern over a slow or broken metabolism, the need to monitor calories or feeling that metabolism declines with age. Since Nutrient Biochemistry was my FAVORITE college course, let’s do a little Metabolism 101. Metabolism has been dumbed down to calories in vs calories out, which may lead you to believe that metabolism is only your propensity toward weight loss, weight maintenance or weight gain. However, my truer and more accurate definition of metabolism is “every chemical process that keeps your body alive and thriving”. You can think of metabolism as an umbrella term for every metabolic process your body performs, even down to the cellular level: cell turnover, energy production and energy metabolism, producing hormones and maintaining their balance, making neurotransmitters and other neurochemicals that function in the brain, digestion – digestive enzymes, motility, structure and function, sleep cycles and rhythms…I could go on and on but I’m sure you get the point. EVERYTHING your body does, even those things it does without you ever knowing, IS your metabolism. These metabolic pathways can only do their job with required nutrients – vitamins, minerals, antioxidants, phytochemicals, glucose, amino acids, fatty acids, etc. While we do measure metabolic output in calories, we don’t feed metabolism with calories and calorie restriction usually means inadequate nutrient intake leading to a lower metabolic output. Translation: not eating enough just lowers your metabolism while eating adequately can normalize it. Your body is wired for survival and it will adapt to dieting, especially after multiple dieting attempts. The good news is that metabolism is flexible and can be restored with adequate energy and nutrient intake. You’ll have to understand that your body is confused so it may take patience and consistency for your body to adapt to a new well-nourished and satisfied state. Some of you may be wondering about just taking a multivitamin. A nourished and satisfied state CANNOT be achieved in a pill. The physical and psychological response to eating FOOD is absolutely irreplaceable. Eating a variety of nourishing and satisfying foods is encouraged, recommended and necessary. Also, we have isolated and named only a handful of different vitamins, minerals, antioxidants and phytochemicals. Given that nutrition is a relatively new field of research, there are perhaps hundreds if not thousands or millions more that we may never name but are found in the food we eat. I would argue that we don’t really NEED to know, if we just eat the food. Mother nature, in a very broad sense from food to sun exposure to being active, has us covered. You can think of all these metabolic pathways as links in a chain with a domino effect; one leads into another leads into another leads into another. You can image then that if a metabolic pathway doesn’t have the materials it needs to perform, every pathway after it will not be able to perform it’s function either, decreasing your metabolic output. Your body is always talking to you and if your metabolism is not functioning at it’s full potential, you will likely notice signs such as fatigue, poor sleep quality, poor exercise tolerance, headaches, digestive issues, hormone imbalances, nutrient deficiencies, blood sugar fluctuations, etc… The common response to those concerns is to be more restrictive with food, cutting out whole food groups or certain food substances. I assure you that this will likely create more issues than it solves. Eating a wide variety of fresh, wholesome foods and having a flexible approach to meal patterns while honoring intuitive signals of hunger and fullness will be the best way to support a healthy body and mind. There are other factors that can influence metabolic function, primarily stress. When in the “fight or flight” state, the last thing your body is worried about is digestion or sleep or making enzymes…it’s only concern is survival. It has to outrun a tiger, metaphorically speaking, so all available energy is moved into the blood stream and those metabolic processes which aren’t absolutely vital are halted. Essentially we have discussed two ways to increase your metabolism – eating adequate amounts of food/nutrients and relaxation. They are often very much related too – running on adrenaline usually means no time for regular, balanced meals. Also, feeling stressed and anxious with food is now obviously counterproductive. This is a much different way to think about health than the “eat as little as possible and exercise a lot” mentality. Eating consistently and regularly, moving your body to maintain your lean body mass and to keep joints loose and fully mobile while finding ways to manage stress and decompress will be the best way to support a healthy metabolism. 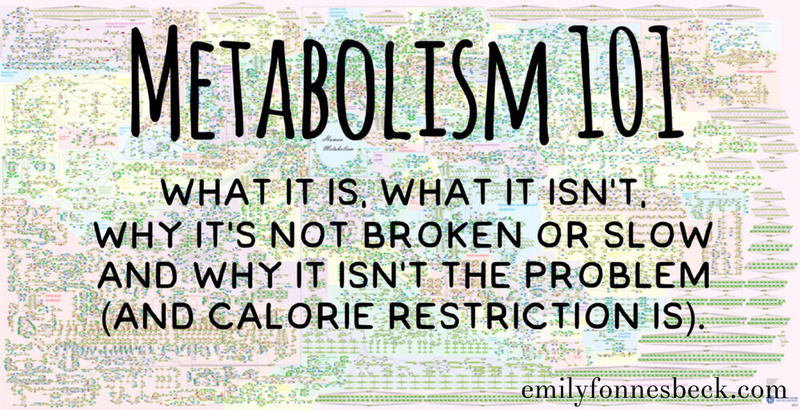 While your metabolism will be unique to you, it isn’t broken, it isn’t slow and you can maintain it’s full potential by avoiding calorie restriction and letting your stress get the best of you. Finally, worry a lot less about metabolism. Your body is fully aware of what it needs to function. Listen, respect and honor what it is saying, recruiting a Registered Dietitian to help you overcome possibly years of dieting, the diet mentality and calorie restriction. You should be reassured that your body can and will heal with consistent and positive self-care practices. Thank you for reading Selina, glad you enjoyed it! I hope everyone on the planet reads this. So incredibly good. Thank you! Thank YOU Julie, that means a lot! 🙂 Glad you enjoyed it. Fantastic, and SO needed!!! Thank you for writing this! Sharing and shouting from the rooftops! Excellent article. Easy for everyone to understand while clearly explaining everything. Fabulous article – Taking such a complicated subject matter and translating it into easily understood language, just wonderful. From one dietitian to another thank you so much for taking the time to research, write and share. Thank you for reading Jennifer! I appreciate the feedback, it does seem like such a misunderstood topic. I am glad to connect with you! Thank you for reading Sharon, I appreciate your feedback! It was fun to write and I am glad it has been helpful. Thank you for this article. I feel like there is so much nutrition information out there, but so hard to know who is a reliable source or not. It’s nice so hear coming from a dietician. How long do you think it might take on average for metabolism to normalize after 9 months of fluctuating between calorie restriction and calorie maintenance?